This recording gathers several important examples of the less familiar Edvard Grieg as composer of songs with orchestra. 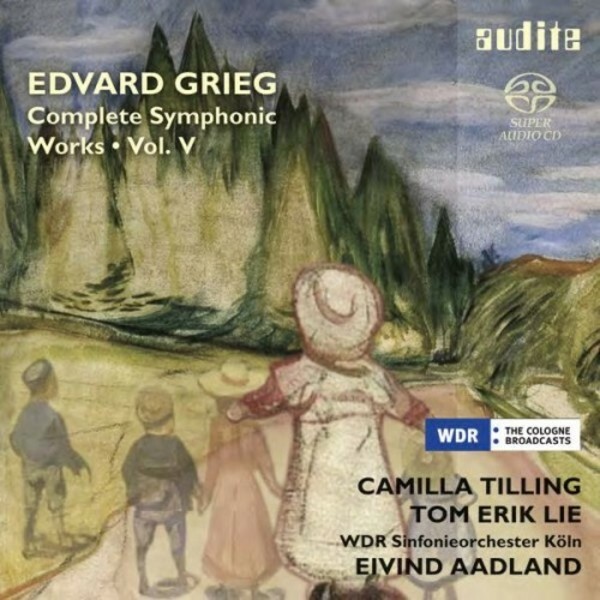 Soprano Camilla Tilling plays a leading part in this fifth and final volume of Audite�s complete recording of Grieg�s orchestral works: although Grieg drew on his own songs with orchestra or piano for the 'Six Orchestral Songs', this set forms an independent, elegiacally-hued cycle reflecting the core of Grieg�s personality. It includes not only two songs from the incidental music to 'Peer Gynt' (Solveig�s Song and Solveig�s Lullaby) but also transcriptions of solemn piano songs such as the Roman ballad 'From Monte Pincio', or the memory of the short-lived Norwegian patriot Henrik Wergeland, to whom the final song (sung by Tom Erik Lie) is dedicated. Cities such as Oslo and Bergen, where Grieg worked as a conductor, did not provide inspiration for his compositions: in order to be able to write, he travelled to the countryside. He particularly loved the wild region of Hardanger in West Norway, where he found the most original folk music and where he spent several summers. Here, he composed not only his 'Norwegian Dances', but also the short orchestral ballad 'Den Bergtekne' (The Mountain Thrall), in which Grieg portrays himself as a restless poet, at odds with love.